Always wear appropriate shoes when operating your vehicle. Unsuitable shoes (high heels, ski boots,etc.) may interfere with your ability to use the brake, accelerator pedal. 1. Carry the smart key or leave it inside the vehicle. 2. Make sure the parking brake is firmly applied. 3. Automatic Transaxle - Place the transaxle shift lever in P (Park). Depress the brake pedal fully. You can also start the engine when the shift lever is in the N (Neutral) position. 4. Press the engine start/stop button. 5. In extremely cold weather (below -18°C / 0°F) or after the vehicle has not been operated for several days, let the engine warm up without depressing the accelerator pedal. Whether the engine is cold or warm, it should be started without depressing the accelerator pedal. Even if the smart key is in the vehicle, if it is far away from you, the engine may not start. When the engine start/stop button is in the ACC position or above, if any door is opened, the system checks for the smart key. If the smart key is not in the vehicle, the “ ” indicator and a message “Key is not in the vehicle” will appear on the instrument cluster and LCD display. And if all doors are closed, the chime will sound for 5 seconds. The indicator or warning will turn off while the vehicle is moving. Always have the smart key with you. The engine will start, only when the smart key is in the vehicle. Never allow children or any person who is unfamiliar with the vehicle touch the engine start/stop button or related parts. 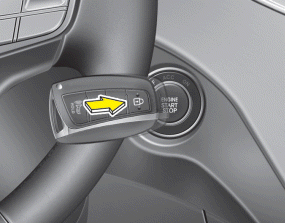 If the engine stalls while the vehicle is in motion, do not attempt to move the shift lever to the P (Park) position. If the traffic and road conditions permit, you may put the shift lever in the N (Neutral) position while the vehicle is still moving and press the engine start/stop button in an attempt to restart the engine. If the battery is weak or the smart key does not work correctly, you can start the engine by pressing the engine start/stop button with the smart key. The side with the lock button should contact the engine start/stop button directly. When you press the engine start/stop button directly with the smart key, the smart key should contact the button at a right angle. When the stop lamp fuse is blown, you cannot start the engine normally. Replace the fuse with a new one. If it is not possible, you can start the engine by pressing the engine start/stop button for 10 seconds while it is in the ACC position. The engine can start without depressing the brake pedal. But for your safety always depress the brake pedal before starting the engine. Do not press the engine start/stop button for more than 10 seconds except when the stop lamp fuse is blown.